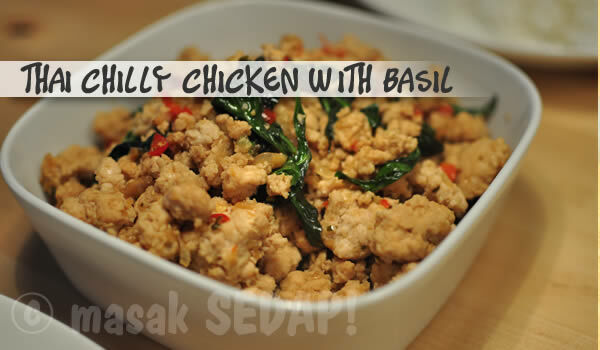 Hot chilly chicken with basil leaves – Masak sedap! It’s spicy, it’s hot, tasty and it’s thai! You could use either chicken or beef in this dish. Since i love anything chicken, especially because they are so tender, I choose to use chicken breasts. If you have more time and don’t mind deboning your chicken, use upper thighs instead. Basil leaves are often found in thai cooking. It puts a refreshing lemony taste to your dish. You use usually only the leafy parts of the plant. The stalk is too hard and woody to be processed. Since these leaves burn easily, add them only right at the end. 1. Heat up the oil in the wok, fry garlic until it starts to brown. Add the chicken and stirring lightly till almost cooked. 2. Add all the rest of the ingredients, adding the basil leaves only right at the end. Serve hot with steamed rice.